Discover best practices and real life examples in character development. Convene with other character educators and build a strong support system. Achieve individual certification in a reputable character framework. 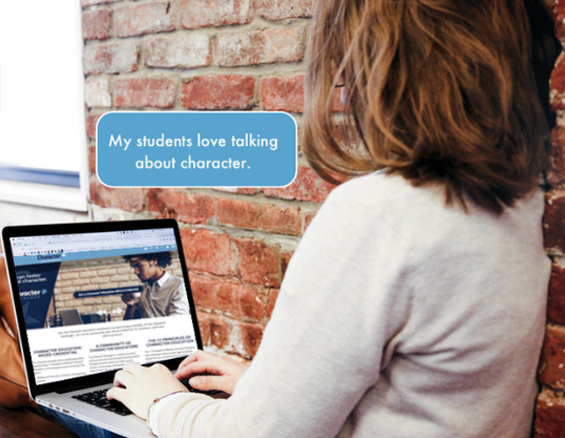 The Character Exchange is a one-of-a-kind platform for educators to gain the professional and personal development needed to improve school culture. What Makes the Exchange Special? An intensive course based on the 11 Principles of Effective Character Education. Educators are always on the lookout for opportunities to make an impact on their students and advance their careers. And with research showing a correlation between character education and student success, the ability to bring character into the classroom is a must. 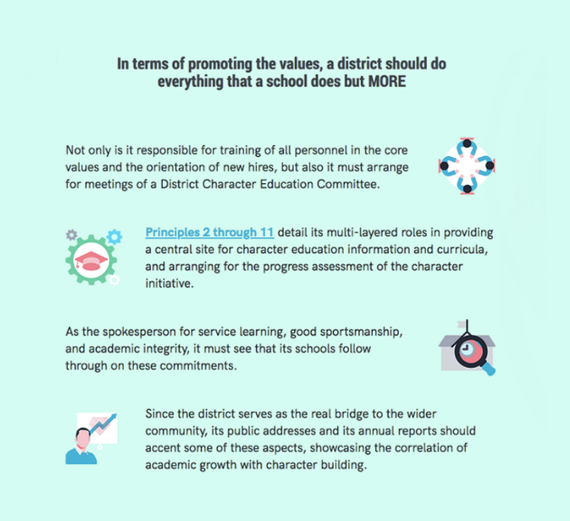 For nearly 25 years, the 11 Principles of Effective Character Education has been regarded as the most comprehensive framework for validating character initiatives. Educators from all over the world have utilized Character.org’s framework, impacting millions of lives and fostering better communities. Exclusive to the Character Exchange, we will offer an online version the 11 Principles. Educators will be able to delve deep into the 11 Principles and get a fundamental understanding of the best practices of effective initiatives. You’ll receive feedback on your responses throughout the course and help from mentors if you run into challenges. After learning about each of the principles, you’ll develop a plan you can use to help improve your school’s character initiative. Exchange experiences and resources with other people who share your passion for character. But the Character Exchange is more than a certification course. It’s a place to convene and exchange ideas, past experiences and resources with people who are just as passionate about inspiring others as you are. We’ve built a user-friendly discussion forum that provides a safe space for subscribers to help each other along their character journeys. We’ve also teamed up with a host of ambassadors who will be connecting directly with our subscribers to guide them along the way. They’ll be sharing their wisdom and experiences in our community. This is your chance to brainstorm with some of the thought leaders and experts in character education! Features a simple and easy to follow track filled with high-quality graphics and video lessons. All of the content featured on the Character Exchange was created from established research and best practices but presented to be easy to use. We’ve used an infographic style for the online course that seamlessly flows from one principle to the next. Every principle is broken down into subcategories for effortless advancement and each page features eye-catching imagery that complements the lesson as well as relevant examples of best practices outlined throughout the text. a framework for creating a character based school culture. a discussion board for advice and conversations around the 11 Principles, and access to the self-paced certification lessons. Staff, ambassadors and representatives of National Schools of Character serve as facilitators to assist you going through the process. conclusion pages. After review and potential feedback, facilitators will manually grant the badge through the system within one week. they have met the necessary criteria. Facilitators will continue to help you as long as your membership in the Exchange remains active. you can facilitate a character committee at your school (with the goal of their school eventually seeking Schools of Character certification). As a member of the Character Exchange you may begin the certification modules at any time and work on them at your own pace. If you have any questions about the Certification process or need assistance please contact Tamra Nast at tamra@character.org. Ready to Experience the Character Exchange? Are you ready to dive in and begin your character journey at the Character Exchange? Sign up today to get access to the resource center and the certificate course for only $249. Who is the Character Exchange for? The Character Exchange was built for teachers, school support staff, administrators and parents who are working together to bring positive changes to our schools and communities by advancing the principles that we know make them better places to learn and work. While the lessons are focused around schools, they offer a powerful framework for workplaces, sports organizations, families and communities. What exactly does a Character Exchange subscription give me? 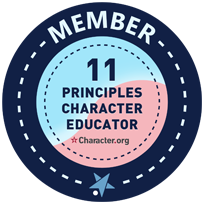 The Character Exchange provides access to self-paced, individual learning modules for each of the 11 Principles of Effective Character Education which you can go through in your own time, on your own schedule. Completing all the modules can lead to a certificate in the 11 Principles. You also receive access to the online community and discussions in which character experts and educators around the world can interact, share best practices, ask clarifying questions and create strong connections. We’ve also carefully curated best practices and ideas from National Schools of Character and Promising Practices over time to create a library within the Character Exchange. Think Pinterest for character development. Take a great idea, and make it even better. What does it mean to be certified in the 11 Principles and what does it do for me? Certification through The Character Exchange demonstrates that you have engaged with the 11 Principles and reflected on your practice. A deeper understanding of the 11 Principles will help you develop a character initiative with your team. We are also currently working with some districts to determine whether it could become eligible for continuing education credits. It’s a full year subscription giving you access to everything within the Character Exchange including the certification modules, curated resources from nationally certified schools and organizations, and a digital community of experts and practitioners. It's $249 for a year long subscription. Is there an additional cost for certification? No. The annual subscription fee includes the community discussions, resources AND the certification parts of the Character Exchange. Will answers to my questions be answered right away? Will there be people on the Exchange “live”? Questions are monitored by staff during the work week but the community is technically “alive” 24/7. Character Exchange Ambassadors, State Schools of Character Coordinators and other users may answer questions before staff get to them, as we recognize that the group has tremendous collective wisdom to share. How can I get in touch with someone from the Exchange if there are any issues? You can post questions in the Ask the Team area or contact the Community Manager, Colton Qualls, at Colton@character.org. Is there a reduced cost for schools paying for all of their teachers to join the Character Exchange? This project was made possible through the support of a grant from the John Templeton Foundation. The opinions expressed are those of the authors and do not necessarily reflect the views of the John Templeton Foundation.